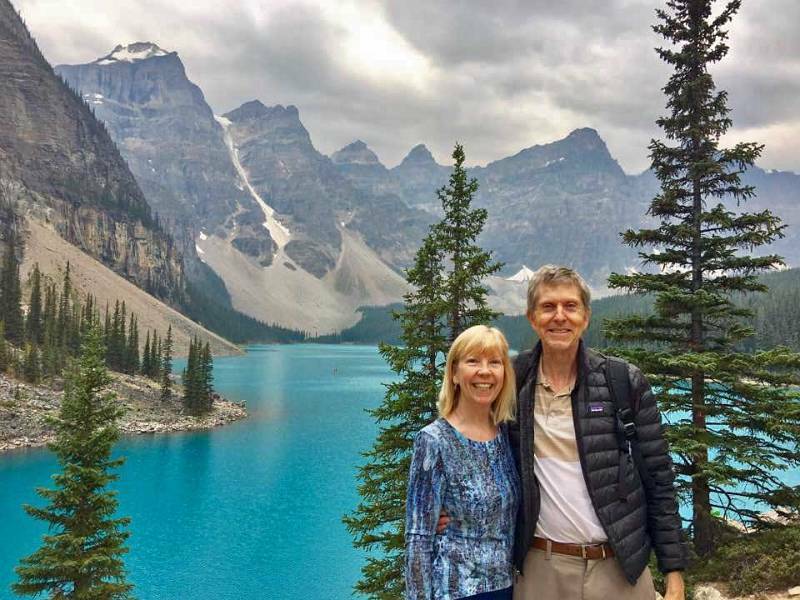 In late August of 2017, we flew to Calgary for our independent Banff hiking tour in Banff National Park and a visit to Jasper National Park in the Canadian Rockies. The weather was sunny on arrival, but the air was choked with smoke from the fires burning in the interior of British Columbia. I’ve made this early fall mistake before, when I visited Yosemite during the Rim Fire of 2013. As we approached the Rockies that afternoon in our comfortable Nissan Altima from Enterprise, we could barely make out the outline of the mountains. We chose to ride the Banff Gondola anyway. The town of Banff was barely discernible from the top, but the bison burger and fries at the restaurant there helped my mood a lot. Afterward, we drove just past Lake Louise to the Great Divide Lodge for 4 nights. 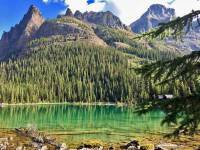 The Great Divide Lodge has the most reasonable rates in the area. They don’t participate in online booking engines, so it’s a matter of a telephone call. Take advantage of their 48 hour cancellation policy and the fact that they don’t pre-charge your credit card. Front units have a view of Wapta Lake. The Lodge provides an included simple breakfast. 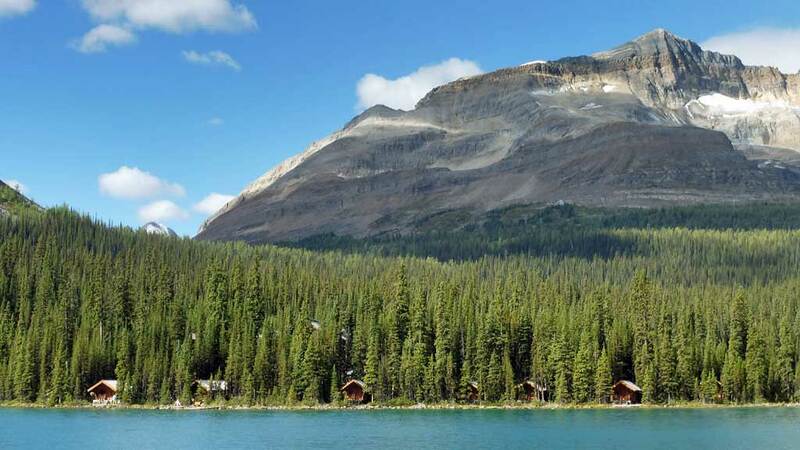 You can’t beat their room rates and their proximity to Lake Louise. On our first full day, we drove a few short miles to the start of the controlled access gravel road to Lake O’Hara. No personal vehicles are permitted. You need advance bus tickets and the National Park Service sells these for an entire year online in a few minutes each spring. We asked about standby. There was nothing available and they indicated a 1% chance of empty seats on any given day. We took a 10 minute drive to Lake Louise instead. In Lake Louise, our first stop was at Wilson Mountain Sports to rent bear spray in case we ever got in to Lake O’Hara. 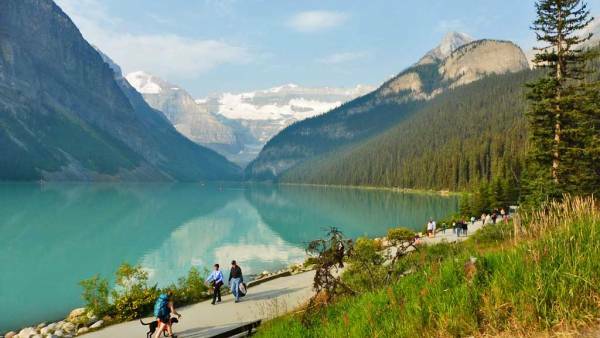 Bear spray is recommended for Lake O’Hara and less popular areas, but unnecessary for hiking around Lake Louise, due to the high volume of tourists there. The daily rental rate was about 20% of the cost of owning a new can, but bear spray can’t be carried on an airplane, so there’s no advantage to purchasing it outright during a short stay. 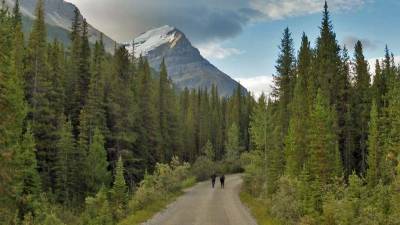 We took the bear spray on our Lake Louise Hiking Tour even though we didn’t really need it. From Lake Louise we began our Banff Hiking Tour by heading up 1300 feet in 2.5 miles to the Lake Agnes teahouse. The temperature was perfect, but the views were infrequent and hazy, even in the cloudless skies. The most commonly spoken language on the route seemed to be German . Lake Agnes was a beautiful spot. My salty potato chips and water tasted like a gourmet meal after the climb. From Lake Agnes, we hiked around the Large Beehive, named for the shape of the mountain. Then we continued along the Highline Connector. 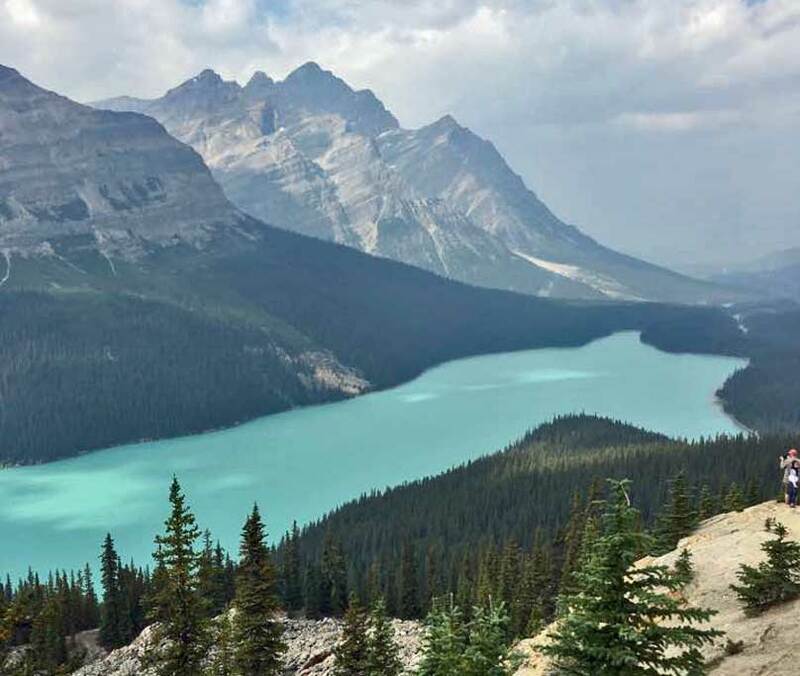 It was a fairly flat trail, but very high up, with some gorgeous glimpses down to the canoes far below on the emerald colors of Lake Louise. 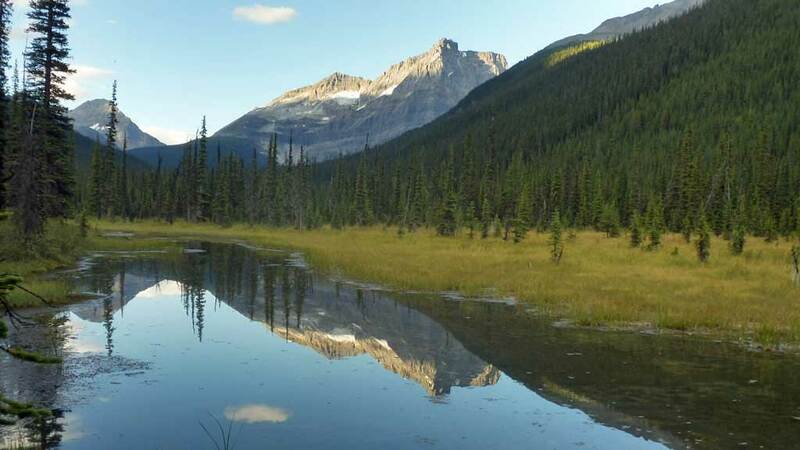 When we reached the first intersection with the Plain of Six Glaciers teahouse trail, we decided that more than 4 hours on our hiking tour that day was enough and we skipped another 3 miles of strenuous climbing. For lunch we headed to the Truffle Pigs Bistro in Field, BC. Then we drove less than 10 minutes to the Natural Bridge, which spans the Kicking Horse River. When we were at the Natural Bridge 5 years early, 20% of the trees were red, as they were dying from a mountain pine beetle infestation. This time, those trees were black and completely dead, but the other 80% were still healthy. The pine beetles had clearly been frozen to death during the cold winter. Their attempt to cross the great divide here between the Pacific and the Atlantic at Field, BC had failed. That night we enjoyed sirloin carpaccio and trout at the Great Divide Lodge. The next day was cloudy, cool, windy and nearly raining. We didn’t even try to standby for the park’s bus to Lake O’Hara that morning. We drove about 20 minutes to Moraine Lake. Before 8 am there is unrestricted access to the parking lot. After that it gets too busy and they only allow buses at the lake. The waters were a gorgeous blue, even under cloudy skies. Next we drove about an hour to Num-Ti-Jah Lodge on Bow Lake. 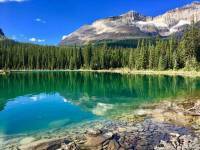 We planned to continue our Banff Hiking Tour with a trek around the lake to Bow Glacier Falls. Unfortunately, the trail was closed due to a small forest fire at the lake edge. So, we drove about 10 minutes to Peyto Lake. Lingering smoke downgraded the view quite a bit. Then we hiked up above Peyto Lake to the lookout at Bow Lake Summit. It was a 4 hour hike. 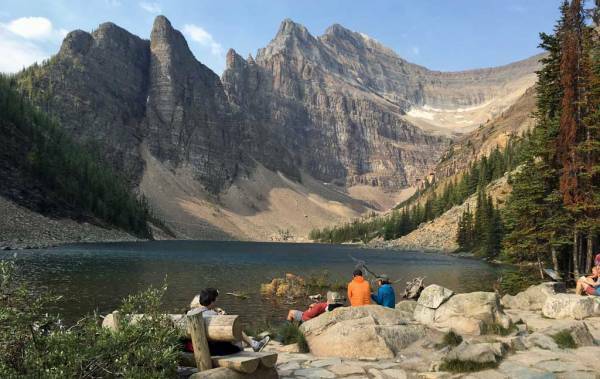 Our Bow Lake Summit Hiking Tour wasn’t as steep as Lake Agnes. We only saw 6 people on the hike and no bears. Afterward, we had lunch at the Trailhead in Lake Louise and repeated the carpaccio and trout at the Great Divide Lodge for dinner that night. You would think you’d lose weight with all the hiking, but your calorie intake adjusts accordingly. On our third and last day of our Banff Hiking Tour in the Banff National Park area, the dawn brought clear, smokeless skies. 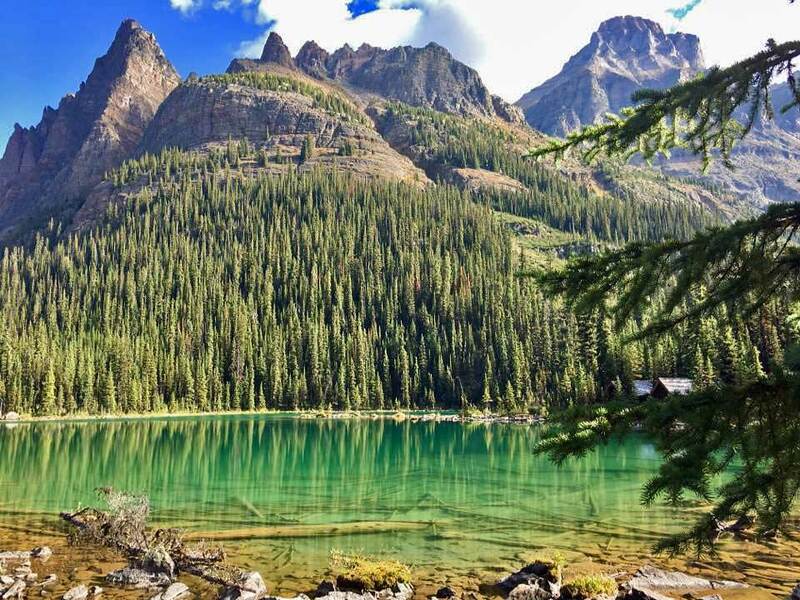 We decided to trek into Lake O’Hara without relying on the park’s bus. 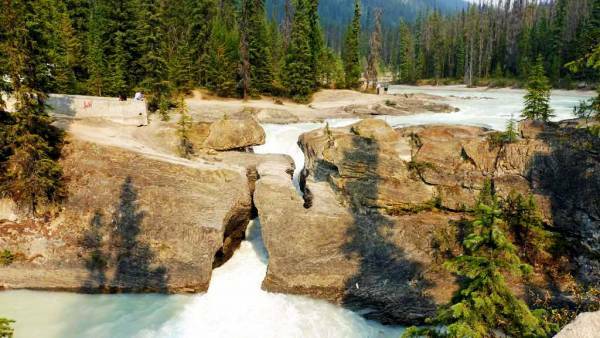 That meant a grueling 3 hour, 7 mile hike up just over 1,000 feet, crossing into Yoho National Park. We saw 6 other people hiking in that morning. There were no bears. The air was crisp and cool, making for a wonderful and peaceful hike along the gravel road. We waved to the 8:30 am bus when it passed us at the halfway point. 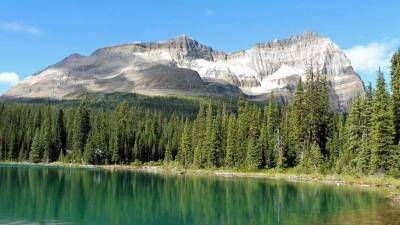 Our Banff Hiking Tour – Lake O’Hara was gorgeous. High mountains surround the lake on 3 sides, which somehow amplifies sound and yet the faint echoes make you aware of the solitude at the same time. We had snacks at the Relais Day Lodge and then visited the interior of the pricey Lake O’Hara Lodge. After that we set out to hike along the lake and up a hanging valley, but with my fear of heights I wasn’t able to do much. 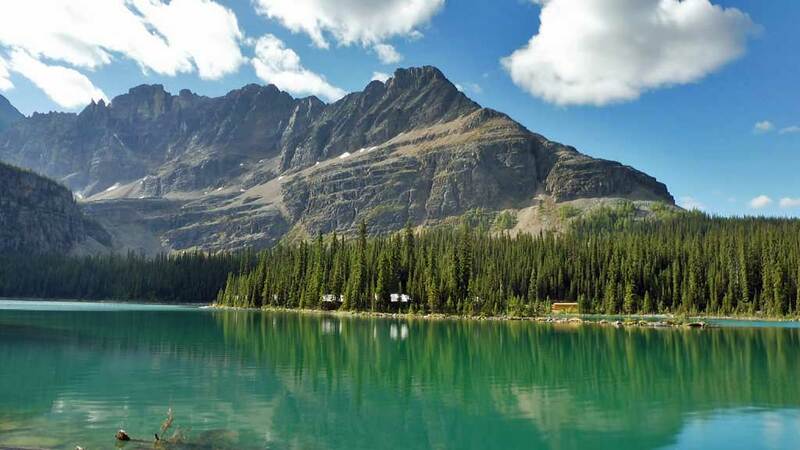 After just over an hour, I felt I’d completed my quest to Lake O’Hara and we were able to catch a standby ride out on the return bus for $10 each. On the way back, a shocking number of hikers were just starting out on the arduous trek in the warm noon day sun. With beautiful skies and lots of time left in the day, we headed to Lake Louise again and this time we headed to the Lake Louise Gondola. 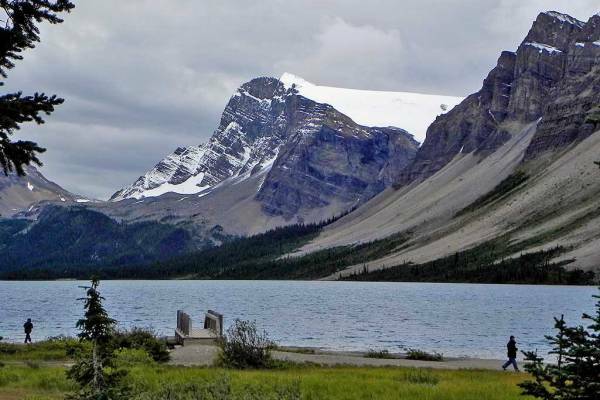 It operates in summer on the ski hill and has lovely views across the valley to Lake Louise. 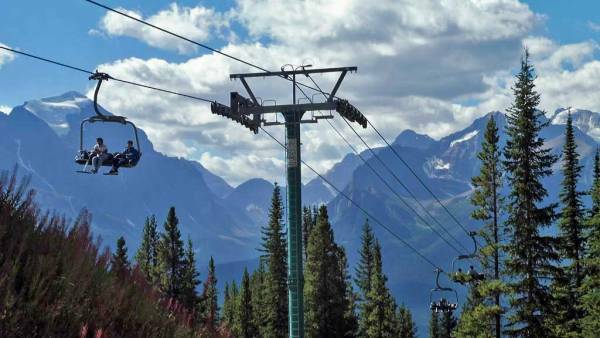 The gondola actually has 2 chairlifts between every enclosed gondola. In the pleasant temperatures, everyone want to ride the chairlifts. It couldn’t have been more pleasant. At the top, we visited the Whitehorn Bistro for lunch. A cold beer on their sun deck with a view of the valley and Lake Louise was more than I could have hoped for. The vegetarian Thai pasta was amazing. 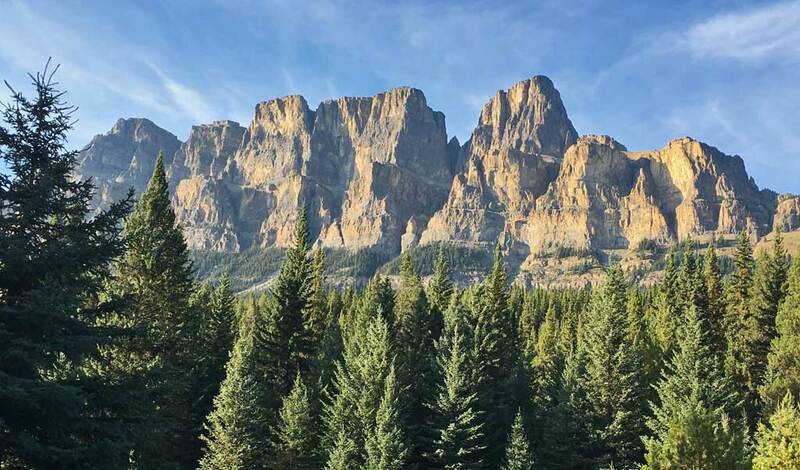 We completed this special day with a drive down the Bow Valley to Castle Mountain. It seemed like a nostalgic return to an earlier pre-internet era , when you’d take a family drive for your evening entertainment. The setting sun lit the mountains on both sides of the Bow River. It was the perfect end to a perfect day. 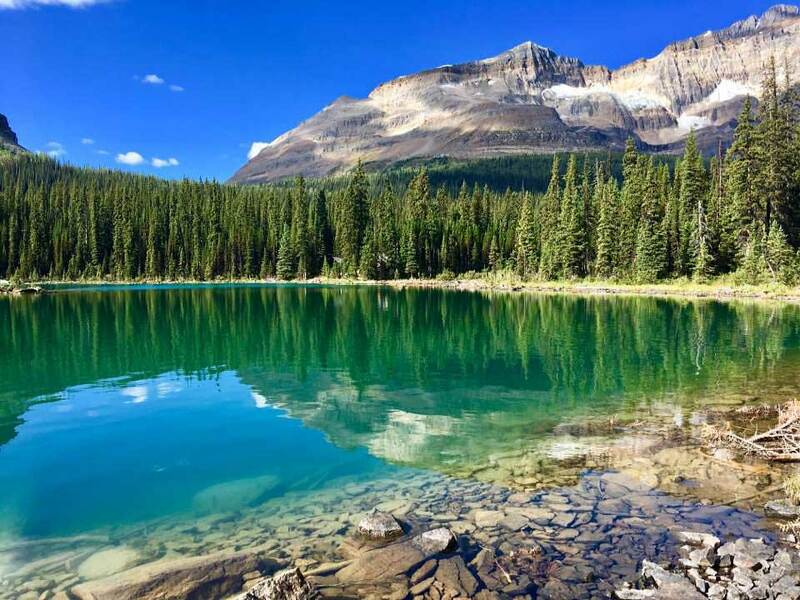 Our Banff Hiking Tour was a great success. The next morning we headed out on our Jasper Tour to Jasper National Park for the second part of our Canadian Rockies adventure.